In anticipation of the correct capacitor arriving, I made up an extension cable, in order that the OMM could be be driven by the MI12 on my desk for testing purposes. Never mind, couple it up to a 10 volt bench supply and do some more testing. PK's tip about the ICL 7660 chip is very interesting. It takes in +5 volts and apparently should 'mirror' this to provide a -5 volt rail, whereas it's producing -3.5 volts. Digging out my 'electric pump' de-soldering sucker it looked ridiculously big compared to the PCB, but with a delicate touch, a bit of flux, and adding some low melting point solder to the last persistent lug eventually got it off with no apparent damage. To go much further I'm going to have to make a rig to mount the circuit so that I can safely probe it without doing damage, and also to make up an IR transmitter that sends a train of pulses so I can trace through the circuit. If indeed one of the circuits is pulling down the -5 v it's going to be a pain to find as the LM833's, the LM311, The AD848 and the LM392 all take the negative rail voltage. Won't be much more progress today as I have to play host to some guests arriving this afternoon. I made up a mounting jig to stop the PCB skidding all over the desk when testing ! OK so the problem is to try and work out which component or components is drawing too much current from the negative rail, and dragging it down from -5v to -3.5 volts. I hit on the idea of looking at the board with my infra red thermometer - now it's by no means easy to be sure exactly where it is pointing, but looking at each integrated circuit the hottest was the ICL7660 - not surprising as we know it's probably over loaded. (I think that it can supply about 20 mA) - it was running at about 39 degrees whereas the other ICs are at about 26-28. 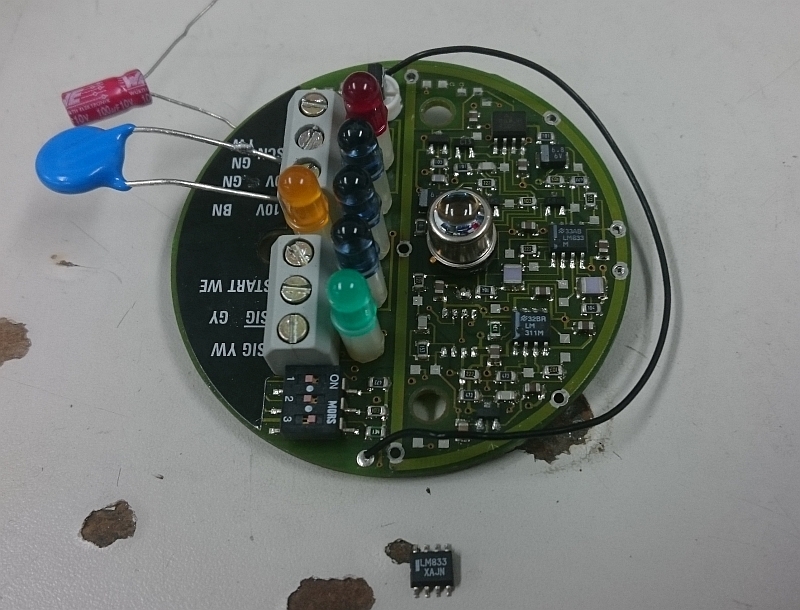 But scanning the board in general one of the capacitors was running at over 40 degrees - is this our trouble maker? It's the 68 uF / 6 volt one next to the famous one with the paint blob and is the one used by the ICL7600 to do the voltage inversion. It's position on the PCB and (relatively) large size allowed me to remove it with a fine tipped soldering iron and substitute an axial one for testing. Now if this was a conventional sized board with DIL I/C's I'd carefully lift the -VE rail input legs on the I/C's one by one and monitor the voltage on the negative rail to see who's causing problems - not really possible at this scale. Another technique is to construct a probe with two very sharp tips close together but insulated from each other, and with it connected to a sensitive millivolt meter, probe the PCB tracks leading to the supply pins in question. The tracks have a finite (but very low) resistance so a small voltage is developed across the probes that is proportional to current. Brilliant in theory but not too good at this scale as you can't really get at the PCB tracks. 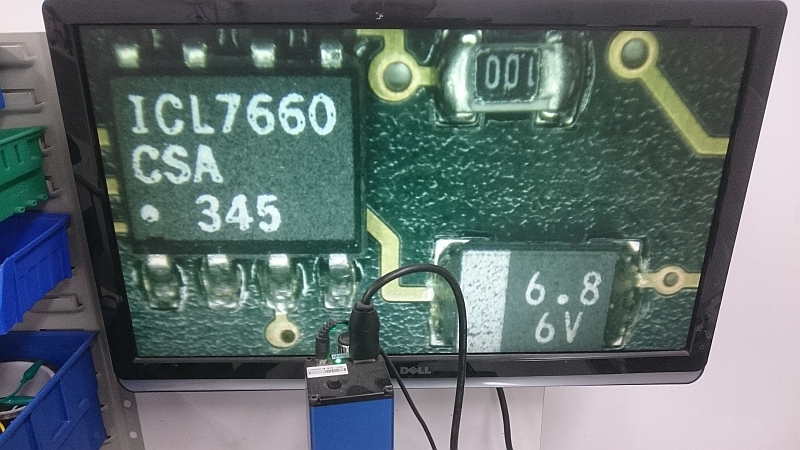 Are you able to inject -5v separately? If something is dragging the line down, that may make it more visible (eg hot), or show it is the converter itself at fault. Yes I had considered that but I'm scared to do more damage. I've dug out a x20 microscope and have been looking round the circuitry, but it is very confusing - the SMD markings are rather coy about what they really are - I have found a document that helps somewhat in the translation (attached) and I have found what appears to be a transistor type 5B (MMBT4123) that seems to be s/c base / collector. It appears to buffer the output of one of the LM833 op amps. I have a hot air gun if you need to borrow it Andrew. SMD working isn't that bad, although I'm not sure I'd want to start with trying to fix something quite so expensive! Key thing is good fine tipped tweezers, as they make positioning components far easier. Also suitable solder paste and dispenser make fitting bits far easier. I don't mind building SMD boards, but the fact good solder paste is so expensive compared with ye olde solder wire, and it goes off, means I try and avoid using SMD, but some times it's unavoidable. Well PK has VERY kindly offered to take a look at this unit as I understand his company has the suitable facilities, so it's started on a long journey to the other side of the world this morning on a '5 day target' service from the Royal Mail. Another example of "It's not what 'ya know, it's who 'ya know!" Is it back yet dad? Still going round in circles as usual Lyn ! The M19 spindle orientation issue is still eluding me. Contacts on the Siemens support forum assure me that it's just a option that needs enabling by setting a 'bit' but which bit ! M19 S180 (which should do the actual motion. Now poking around in the PLC documentation 'QB87 bit 5' is apparently the 'Read-In Enable' bit, and sure enough before the M20 is executed it is 'true', but once the M20 runs it goes low (false) preventing the next instruction being read. And a bit more progress. The OMM PCB and probe have arrived with PK in Perth, Australia and he has it on the bench with power on and is looking at it. I just hope it doesn't make his head spin like it did mine ! So the first thing you do when someone says: "Can you take a look at this for me, it's doing X,Y, and Z", is fire it up and check that its actually behaving that way and there are no other obvious faults. Next we took a look at the negative voltage reg. It is used to generate -5V for the amplifiers and comparitors under that shield. It looks like the 6.8uF cap on the screen is the output capacitor for this reg. It isn't, it's a 68uF cap a bit further away. This was removed and replaced but the voltage was still low. The reg chip was removed and replaced, and the voltage dropped a bit lower to 2.7V! I guess they don't make 'em like they used to. I lifted the output pin and connected a small cap to ground and the voltage shot up to 4.9V So it's probably something overloading the reg. Out came the thermal camera (and yes, I forgot to snap a pic) and one chip in particular was running quite a lot hotter than the others. An LM833 audio amp. Now this may still be a red herring, as audio amps sometimes run hot, and often drive low impedance loads... In any case, it was asked to leave the premises and we now have a -4.7V rail. Oh, and if all this talk of ripping components off expensive PCB's generates anxiety. Don't worry, it's not my PCB..
Now that's the kind of attitude I like! I kinda suspect there are two faults. One with this negative voltage rail, and another with the probe. I'd expect to be able to see some activity from the IR LED on the probe when it see's the start signal, looking at it with a webcam or phone being just a repeat of your tests..... I'll have a sniff around the photodiode on the TX board tomorrow with a 'scope, just in case the response from the probe is on a wavelength that isn't detected by our cameras. All whilst pondering the best way to get into that probe without screwing up the waterproofing..
PK, if it's like other Renishaw stuff I've opened up, it'll be O ring seals I suspect. In anticipation of PK working miracles with the Renishaw Probe electronics, I decided that it was time to plan a re-do of it's wiring. As I think I've previously mentioned, it seems to be a field upgrade with the necessary wiring just draped any old place that they could get it. The MI-12 interface unit is hard wired in, and just sitting on a shelf. I chose XLR style connectors as I already had two of the three, arranging that the 3 pole ones were opposite gender to prevent them being able to be confused. Initially I'd intended to mount them on a bit of the trunking in the cabinet where the MI-12 sits, but then decided that it would actually be easier to mount them in a separate box which then could be fixed to the trunking as an independent item. So a quick pencil sketch, rapidly followed by an Autocad drawing whose DWG file was processed by SheetCAM to give me a CNC-Plasma ready file to cut. Having cleaned up the cut profile with a sanding disk, and made sure that the connectors fitted their odd shaped holes, I then bent it up, and soldered the corners. After a bit of a clean up it got a coat of zinc rich paint followed by a coat of satin black. Well a bit of progress today. A couple of weeks ago a CPU card for the Sinumerik 820T controller popped up on eBay in the USA at an attractive price - usually people ask silly money for them - whether they sell or not is another matter! Anyway this one was just about affordable, and it was from a dealer that I'd actually bought parts from before when I was breathing life back into the Traub lathe. Why do you need another CPU card? Well probably I don't and won't, but if I do you can guarantee the only ones will be priced in telephone numbers ! The real reason though was that there is just a faint possibility that the M19 / M20 spindle orientation issue could be CPU based, after all it not only is running the code and handling the interrupts, but also has some of the RAM on board. So as a diagnostic aid, and then ultimately as a shelf spare it was worth it. So today (having paid the VAT etc on line yesterday) Parcelforce in the shape of Adrian our local man, delivered it. With no more ado I pulled out the original CPU card, put in the new and fired up the machine - ah well no - she's NOT firing up. Oh blast - dead on arrival - never mind - Paypals' 'pay after arrival' has it's uses I thought. Original CPU card re-installed - oh HECK - shes's not firing up - it's blown something up. No, calm down chum, there's RAM on the card, is that part of the battery backed parameter stuff? Sure enough pressing the magic 'Eye' key on the controller when powering up got me into the re-load 'Initial Clear' mode - perhaps it's NOT D.O.A. after all. So new CPU put back in, and again into the 'Initial Clear mode by pressing the Eye key, and I started the long winded rigmarole of reloading all the back up files. I'd just got to a critical stage when the wife needed urgent help - sheep issues - (there are always sheep issues!) - one with 'fly strike' - one limping - loads of carrying hurdles about, penning up sheep and getting thoroughly filthy - actually it was a nasty fly strike occasioned by a partially torn off horn and consequent blood on a Jacobs lamb and did need urgent treatment. OK - wash the maggots off my hands and get lunch (ham omelette) then back to the re-loading of the controller. All went OK, all functions work except of course the M19 /M20 spindle orientation. It was a pretty faint hope, but at least the CPU card has been eliminated and now I have a shelf spare.